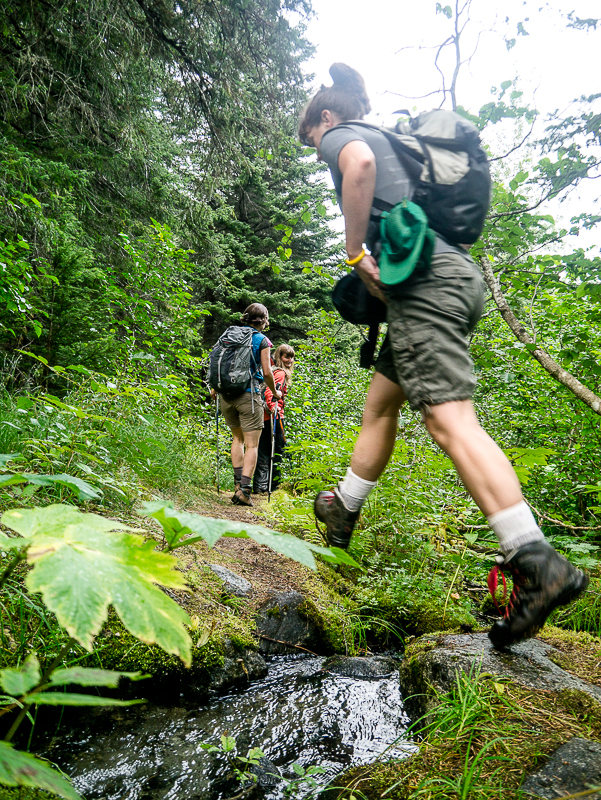 The Denver Glacier hike is an easy hike through coastal rainforest for a peek at the Denver Glacier. 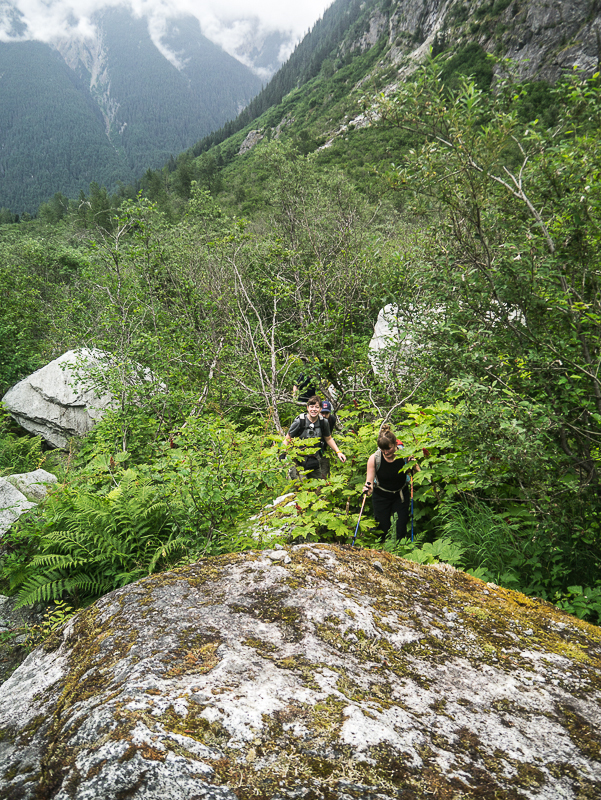 The hike is accessible via a short train ride from Skagway, Alaska. 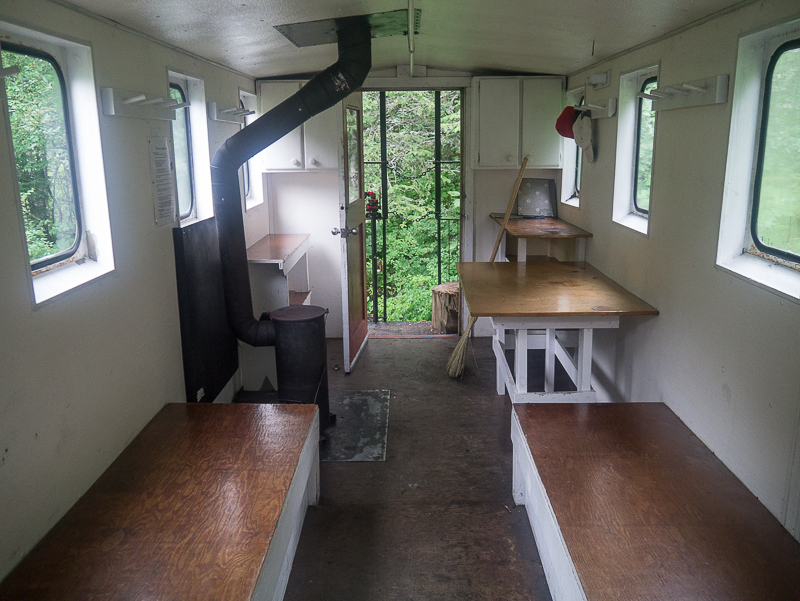 It can be done in a day by coordinating the train drop-off and pick-up times, or better yet you can book the retrofitted 1960s caboose cabin and get the full experience. 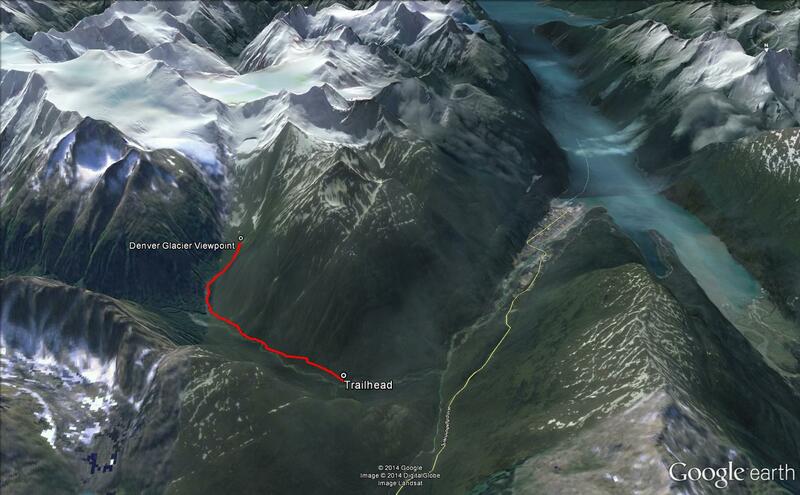 The trailhead is about 8.8 km (5.5 miles) along the railway tracks from Skagway. 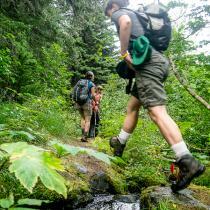 It is accessible via the White Pass and Yukon Railroad from May 1 to September 30. Book your train tickets with the White Pass & Yukon Route (roughly $66 round trip). 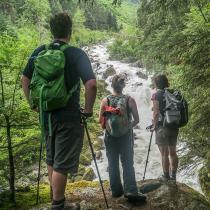 In the off-season people may hike or ski from Skagway, add 8.8 km to the listed hike distance. If you want to stay in the caboose cabin, make sure to reserve your dates ahead of time. It is $35 per night for the entire caboose. 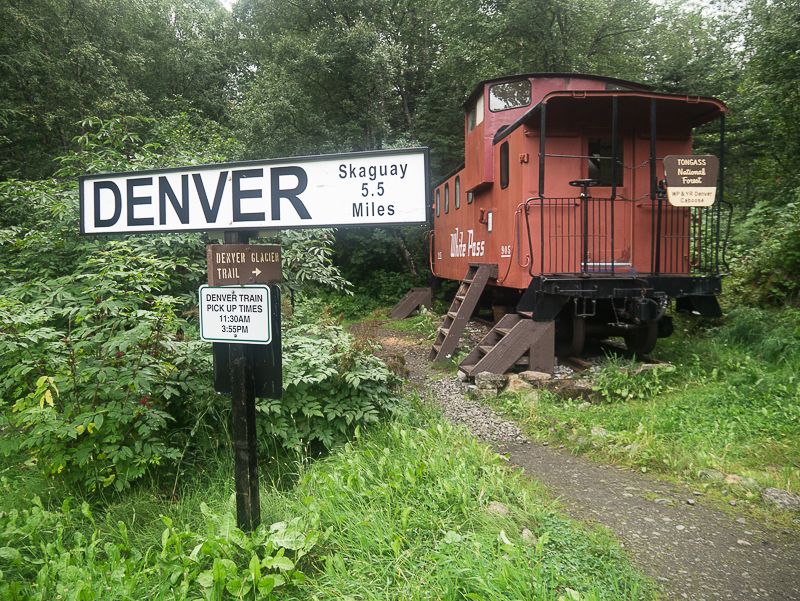 The train will drop you off at the caboose, which is the trailhead. 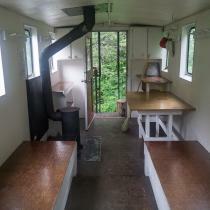 The caboose can be rented (see link above) and sleeps 6, with 4 single bunks and 1 double bunk. There are tables and benches, counters and cupboards, and an oil stove (bring your own fuel for heat). Hang food if possible to keep out the mice. Outside there is a fire pit and outhouse, and the river is close by as your water source (be sure to filter or boil the water before drinking). 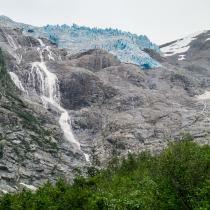 The packed gravel trail to the glacier is easy to follow and is well developed and maintained. 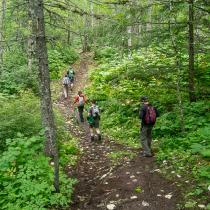 The trail is relatively flat and easy walking for the most part through coastal forest. 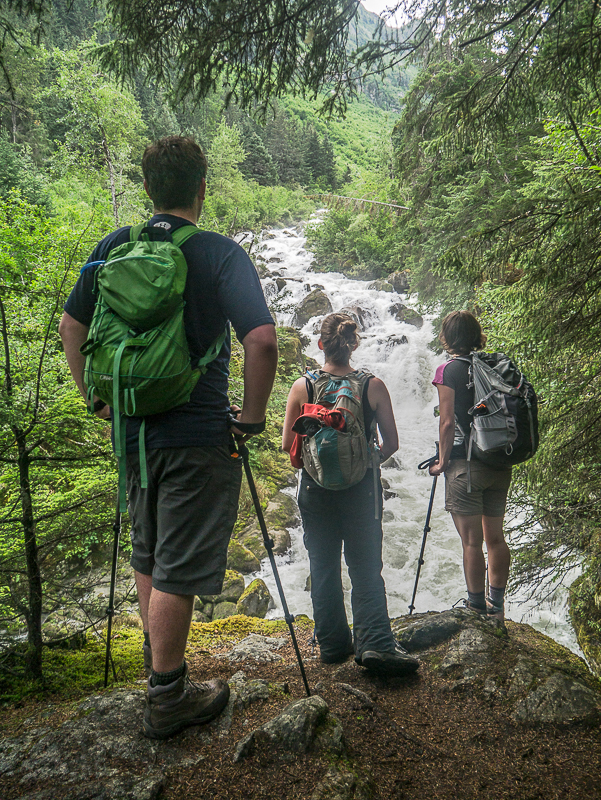 The trail follows along the East Fork of the Skagway River. There are some nice views over the river along the way. 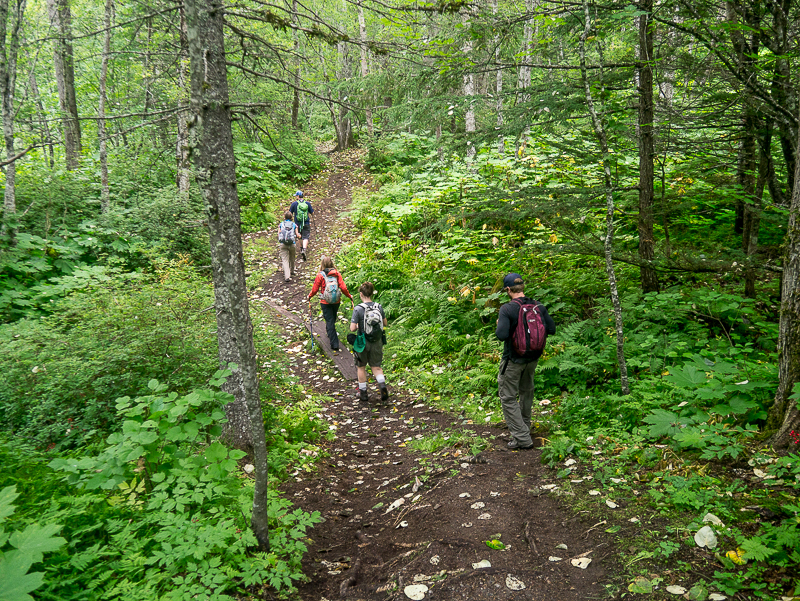 The trail becomes less defined and more braided and overgrown with understory vegetation for the last 200 m of the route. Watch out for the devils club. You'll eventually reach an open area at the base of an old avalanche path with an obvious boulder field. 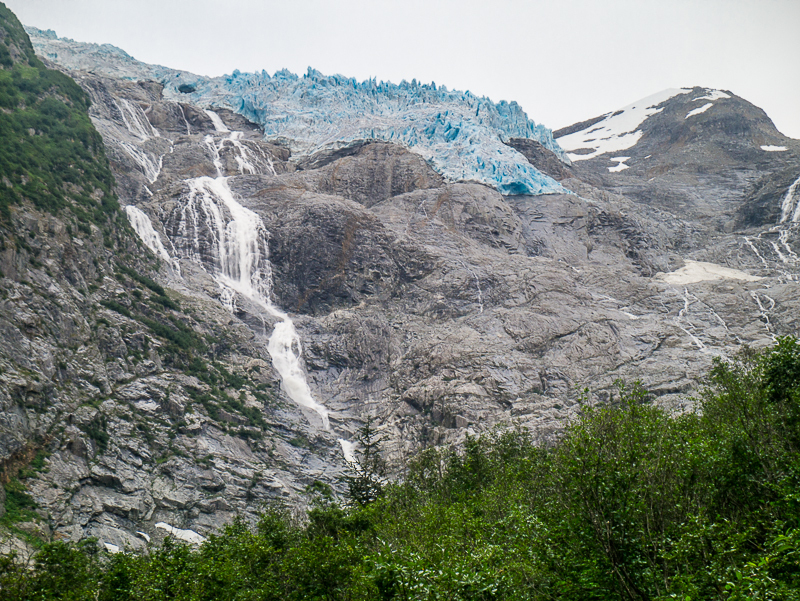 From here you can see the Denver Glacier with it's spiky blue seracs reaching up to the sky and the many waterfalls pouring off the side of the mountain. Return the same way that you came. Have you been to Denver Glacier lately? anyone done this without taking the train? Is it possible? sorry should also mention the cabin is $45 US a night plus a $10 reservation fee - with the high currency rate, its pretty expensive. 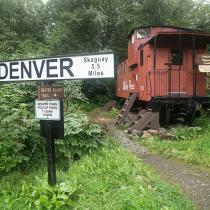 The train return is $34 US from Skagway. We completed this trail last weekend. The train dropped us at the caboose and we dropped our stuff and followed the clear trail through the rainforest. It protects you from the rain, but also high humidity. Its very green and beautiful! The trail then comes to the first viewpoint which is the river/waterfall, from there it goes to the next viewpoint which is of the glacier. Which wasn't visible due to fog and clouds. We decided to continue as it appeared as though the trail did and to possibly get closer (even though we couldn't see anything). 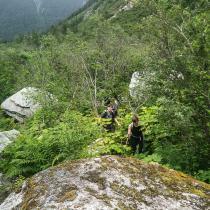 This section had boulder-like sections that are very slippery and very overgrown with deevil's club. I would recommend taking a machete for sure! We didn't go that much longer though as most were fed up with being stabbed by devil's club and everything being wet! We returned and it took about 5 hours with 6 of us just cruising along. The trail has mile post markings on the trees. The highlight is most certainly staying in the caboose which I recommend! !